Almost every internet marketer is now using at least one gmail account to run their business and/or correspondence. Some marketers have more than one gmail account for a variety of purposes. Gmail is a great email account and offers many advanced properties and functions. I want to show you just one gmail feature, forwarding your gmail account. You might ask yourself why you would want to forward your gmail account. The reason is simple, to help you stay organized. Imagine you had 20 gmail accounts for your email, these accounts could be for paypment processing, product sales, different for some of the none internet marketing niches you work with…..could be just about anything. 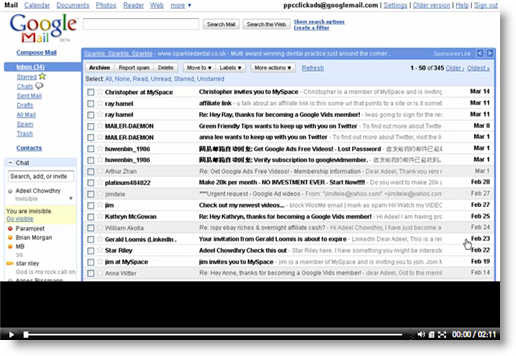 The reason you would want to forward your gmail accounts is to keep yourself organized. I’ll show you how to forward any of your gmail accounts to any email address you want. Lately I’ve been mesmerized by the implications of internet video on website traffic. Whats’ the big deal you ask? Because three Internet marketers I know have stumbled on a formula that uses Intenet video to generate UNBELIEVABLE TRAFFIC AND SEARCH ENGINE RANKINGS–in as little as 24 to 48 hours! These guys are sharing their secrets about using online videos to generate tons of traffic to your sites and get one googles first page. Using their advice, I’ve learned a ton about online video and traffic generation. Man….I hate sounding like a salesman, but, I really want you to know about this if you’re stuggling or just want more website traffic and want page one of google.